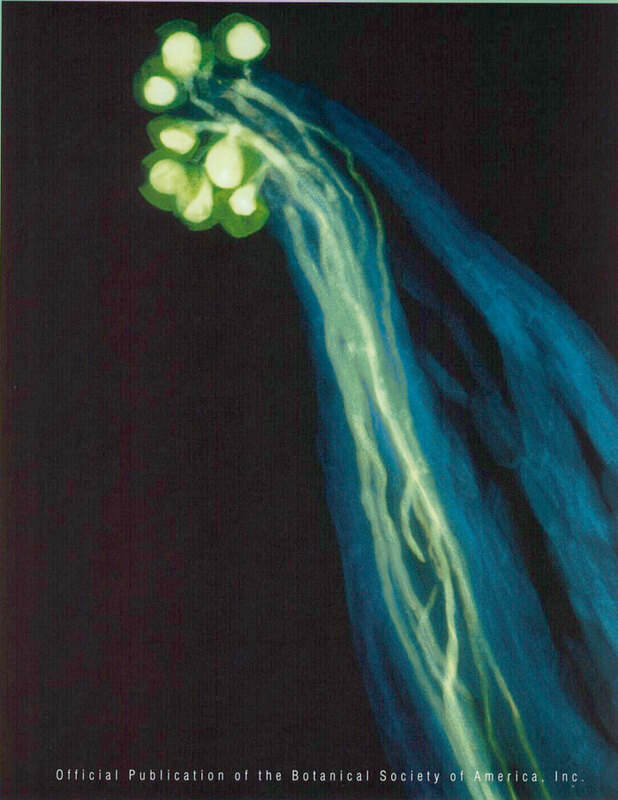 Pollen germination and tube growth in the snow buttercup, <IT>Ranunculus adoneus,</IT> photographed under fluorescence microscopy. Snow buttercup flowers exhibit heliotropism, the capacity to track the sun's rays over the course of the day. The adaptive significance of solar tracking in snow buttercups is mediated through the impact of flower heliotropism on paternal and maternal floral environments. In controlled crosses, pollen from solar-tracking flowers has higher germination success than pollen from experimentally restrained flowers. Solar tracking in recipient flowers also enhances pollen germination and increases pollen tube to ovule ratios.